Hi loves! How are you today? I am having this annoying cold, causing my nose to run and there is cough coming up too. I don't want to get sick! 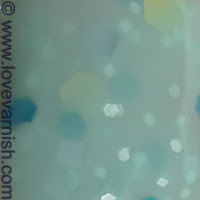 Today I am showing you 2 polishes from the Memories in Colors collection, created by Crazy Polish Lady. Crazy polish lady is actually called Sofia and she lives in Portugal. European indies! Easier to get! Yay! She has just released this second collection, based on Disney films. Aaaah, the childhood memories of watching those Disney movies ♥. I actually saw The Lion King in the movie theater as a little girl, it was the first movie I ever went too! Obviously I was heartbroken when Mufasa died :-(. My picks from this collection are Under The Sea (The Little Mermaid) and A Whole New World (Alladin). They are jelly based glitter, I used Essence 24/7 Nail Base and topped it with 1 coat of Essence Better Than Gel Top Sealer. First up is A Whole New World. 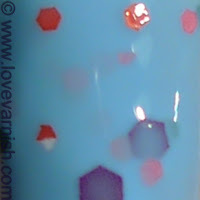 The blue jelly base holds matte hex glitters in 2 (small and medium) sizes and multiple colors (I spotted purple, red, pink, green, and blue). It builds up nicely and has a good formula. I used 3 coats to be sure I had enough glitter on my tips, but the color was opaque at 2. I just nubbinized and it always takes a while for me t get used to painting them so you can probably be done at 2 coats! You can still see the glitter below but it does have a good opacity. Next up is Under The Sea. This mintgreen jelly base also holds various matte/satin glitters: tiny white hexes, small white squares, small teal hexes and medium springgreen hexes. The springgreen hexes weren't really into playing on my nails, so they aren't seen on every nail. Where you could get away with 2 coats on A Whole New World, this one definitely needs the 3 I applied. It applies flawless, just make sure to let the coats dry in between otherwise it'll drag. These polishes are 15ml and in the "standard" fat round indie polish bottle. They are € 6,- a piece (cheap!) Crazy Polish Lady can be found on Facebook and her own blog. She ships internationally, up to 6 bottles it is € 6,-, 7/16 bottles is € 12,50. You can order via e-mail (check her blog) or a message on Facebook. Tell me, do you like these? And did you ever hear of this indie brand? Omg, I'm so happy for Sofia *. * She's an awesome girl, and I'm really happy and proud for her. She diserves this :) I'll get all of them, as soon as possible *. * Love all of them. That's so great to hear! They are gorgeous so yes, get them :D! Right?! Lovely new indies ♥. You were actually the trigger for me to get them! That's so sweet to hear, you are genuinely proud of her :-) I love that! A Whole New World looks really great! I'm loving this kind of glitter polishes. I'll surely have a look at her blog, it's always nice discover new polishaholics! Thanks for posting Deb!